Bank Director recently held their Acquire or Be Acquired (AOBA) conference in the Arizona desert. It is a well run, well attended conference. When not there, which I wasn't this year, I follow the hashtag on Twitter. But the title of the conference bugs me. It's a Hobson's Choice. According to Wikipedia, which is how I might have written college papers had it been available, Thomas Hobson was an English horse stable owner that gave buyers the choice of taking the horse in the closest stall or none at all. Translated to AOBA, merge or die. But is that your choice: acquire or be acquired? What if, I don't know, you want to execute your strategic plan without merging? I often say that "it all comes down to a spreadsheet". It doesn't mean that I wish it so. I want financial institutions to build an enduring and independent future. For the benefit of their customers, communities, and employees. If you have accepted shareholder money, i.e. you are owned by stockholders, you must also function for their benefit. One reason for the continued decline in the number of financial institutions, in my opinion, is the lack of balance in serving constituencies. Ignore one constituency to focus on another leads to problems, or the lack of alternatives, i.e. Hobson's Choice. AOBA. So here is how I propose you work your strategy for the benefit of constituencies while keeping your eye on shareholders at the same time. Build a strategic plan that is aspirational. Shoot to become the financial institution you want to be. Identify it, and set strategy to achieve it. When you target such a future, which should benefit all constituencies, develop financial projections on what success would look like, in financial terms, if you nailed it! How far out should you project? As far out as you estimate it would take for the full economic value of your plan to play out. This could be three, four, five or even more years. Long term projections allow management teams to make strategic investments to build an enduring future. Budgets allow management teams to think short term, and delay strategic investments. Naturally, I have a spreadsheet for you from our hypothetical banking company, Schmidlap Bancorp. Full disclosure, I used Evans Bancorp in Hamburg, NY. 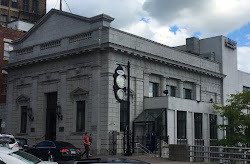 A well run, $1.3 billion in assets financial institution near Buffalo. They are not a client, so I know no inside information about the bank. Although the base period are their 2017 numbers, the projections are my own, not theirs. But I will refer to them as my hypothetical bank name. Schmidlap's strategic plan includes near-term strategic investments that will adversely impact their earnings in Years 1 and 2. Their strategy is to achieve a 1%+ ROA in four years. Their plan has them achieving their aspiration. The board and management team, in balancing their duty to shareholders, developed the present value per share of implementing this strategy. The table above shows the per share results. Schmidlap currently trades at 18x earnings, and their per share price was $40.70 at last close. If they execute this plan, and maintain an 18x earnings multiple, then the present value of executing this plan is $42.97 using a 10% discount rate. Perhaps you think this is uninspiring. But we are discounting results by 10%. So this plan should result in a 10% plus compound annual growth rate in their stock price if they succeed. 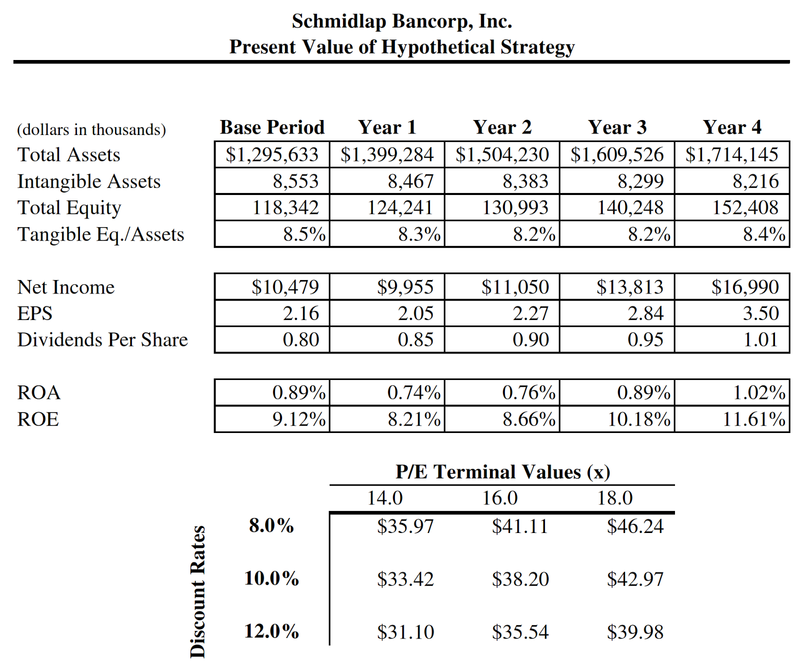 Note that Schmidlap pays a 2% dividend yield. So the annual total return of this plan would be 12%+, all things being equal. But wait. An investment banker presents to the board that Schmidlap could reasonably achieve $46 per share in a sale. A 13% premium to their current stock price of $40.70, and a 7% premium to the present value of their strategy. This is termed the "strategy gap". If the gap is beyond board tolerance levels, management could revisit their strategy and sharpen their pencils, seek a downsteam merger partner to stoke earnings growth, or some combination. If they can't bridge the strategy gap, then perhaps a sale is in their future. And the investment banker smiles. Hold on though. By remaining independent, and assuming management does not do wild things to materially elevate risk, Schmidlap maintains the option to sell into the future if they are not successful in executing their strategic plan. In most instances you can achieve a premium in a sale due to the synergies of the combination with a buyer. The oft-cited "cost savings". But what is the value of that "option to sell". I have ideas, and they are in the spreadsheet below. 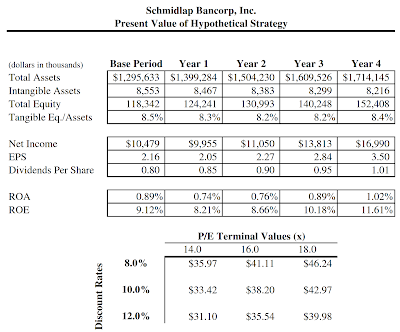 If, in year 4, Schmidlap was not able to achieve their strategy, and they decide to sell, the buyer and Schmidlap would split the benefit of "synergies". In the accompanying table, by 50% although merger negotiations may be more or less. In addition, those added earnings are tax effected, and a terminal multiple applied equal to the difference of Schmidlap's trading multiple, and the multiple currently prevailing if Schmidlap were to sell (23x minus 18x). This yields a per share value of Schmidlap's option to sell at $3.82. So, the present value of Schmidlap's plan, if including their option to sell, is $46.79 ($42.97 + $3.82). And exceeds what they can reasonably achieve in a sale. Since strategic plans and merger multiples will always be estimates when a board makes a decision, I do believe there ought to be reasonable tolerance levels of the strategy gap. For example, if the above math resulted in less than $46, should Schmidlap sell? Probably not if within a board specified strategy gap tolerance level, such as 5% to 10%. There is so much uncertainty in predicting the future, and the bank is operating for customers, employees, and communities in addition to shareholders. But ignoring shareholder value... as one of my Navy captains once said, bad news doesn't get better with age. And the AOBA false choice will be your only choice. Do you apply these principles in strategic planning?